Terminator 6 has a not-so-surprising title. During Paramount's presentation at CinemaCon in Las Vegas, they revealed some promo artwork for the movie, which reveals the title to simply be Terminator. The artwork shows off the title design for the upcoming sequel, while also featuring Linda Hamilton as Sarah Connor. Hamilton is set to reprise her role in what we now know to be titled Terminator for the first time since Terminator 2: Judgment 2 which, for many, is the last time this franchise has been legitimately good. It was previously revealed that this movie will be ignoring the events of the later sequels and will instead serve as more of a direct sequel to T2. Arnold Schwarzenegger will also be returning as the T-800. The actor recently had to undergo open heart surgery and is recovering, but that isn't expected to affect his ability to return. Paramount recently announced that they are delaying the start of production and have bumped the movie from its July 2019 release date, moving it to November 22, 2019. 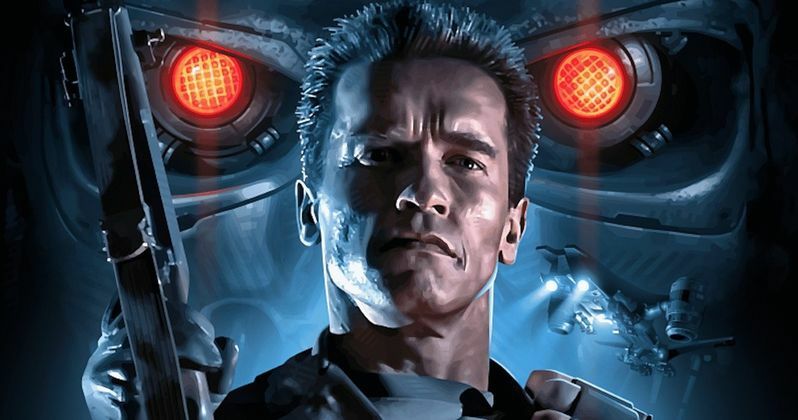 It was reported that the release date delay was not related to Schwarzenegger's heart troubles, despite the timing of the announcement. In addition to the returning cast members, we also recently reported that Gabriel Luna, best known for his work as Ghost Rider on Marvel's Agents of S.H.I.E.L.D., will be playing the new Terminator in the movie. It's not clear at the present time if he will be more of a villain, like the T-1000, or if he will be aiding the heroes. Natalia Reyes (Lady, La Vendedora de Rosa), Diego Boneta (Scream Queens) and Mackenzie Davis (Blade Runner 2049) are also on board as new cast members. David S. Goyer (Batman V. Superman: Dawn of Justice) is penning the screenplay for the movie, which is expected to begin filming soon. James Cameron, who directed the first two movies in the franchise, is heavily involved as an executive producer on Terminator 6. He is currently busy working on his four Avatar sequels, so he couldn't direct. However, Deadpool director Tim Miller has been tapped to helm the upcoming movie, which is the first in a planned trilogy, assuming this one goes well. Skydance's David Ellison was responsible for the more recent movies, but Cameron is getting most of the rights back next year, which is part of what is making this new movie possible. The fact that Terminator: Genisys didn't wind up doing what the studio had hoped has a lot to do with it as well. Currently, there are no plot details available for Terminator, but the idea is to hopefully pass the torch to younger actors and actresses who can carry it on in the future. Given that this promotional artwork, which you can check out for yourself below, features Linda Hamilton's Sarah Connor rather prominently, we can guess that she will play a major part in the movie and won't just be a glorified cameo. Hopefully Paramount will dish some more official details on the plot once filming gets underway.